In the two days since the release of the Cyclists' Bill of Rights, (formerly the Bicyclist Bill of Rights) discussion, discourse and debate have ensued. The title of the document, the content, the purpose, the audience, the inappropriate use of an exclamation point in the conclusion and the cavalier absence of an apostrophe in the title were all and still are topics on the table as the cycling community evaluates the document that lays down the basic rights cyclists possess when they take to the streets on a bike. Of the 12 rights articulated in the CBR, the 12th right seems to leave the largest number of people scratching their heads and wondering how to apply it to cyclists basic right to ride. After all, it’s the free speech amendment. As much as riding a bike, solo or with a group, can be construed as a statement of sorts, the intent of the authors was to exercise the 1st Amendment right to assemble peaceably in the public place as a deterrent to law enforcement attempts to intimidate, harass or break up groups of cyclists riding together. When cyclists ramp up the interaction into a 1st Amendment protected claim of the “right to assemble,” law enforcement is now bound to address the “right to assemble” issue, not the traffic issues that they usually focus on. Identify themselves and declare the gathering an illegal assembly. Give the instruction to disperse and the amount of time the group has to disperse. Witness the most recent USC incident when the streets were filled with people sitting in the street. LAPD arrived, clearly articulated that it was an illegal assembly, clearly gave a three-minute warning and a demand to disperse and then clearly gave the route for exit and offered those in the streets the opportunity to leave. This may seem a bit obtuse and it may seem a bit extreme but consider the environment in which we ride, not just physically as we dodge potholes, opening doors and other obstacles innumerable but also the social and political climate that still finds it shocking when two or more cyclists simply ride in the same direction at the same time and at the same speed. Last year two cyclists were riding on PCH along a stretch that had no shoulder. They were riding in tandem in the outside lane. The cyclists were hit from behind by a catering truck and killed instantly. The driver explained to deputies that he did not step hard on the brakes because his passenger was standing behind him and cooking hot food. Just this past week, four cyclists riding 2 by 2 in the #2 lane of Virgil, on the approach to a red light at Melrose, signaled and took control of the #1 lane and then continued into the left turn lane. The car in the #1 lane continued to accelerate toward the red light, (distracted, drunk, we never found out) and had to stop abruptly when he found himself behind cyclists executing a vehicular left turn on the approach to a red light. 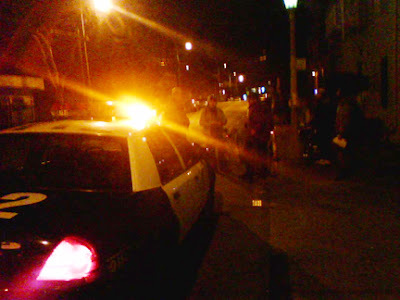 The stories of inequities on the street abound but the bottom line is that the police still get calls from the community consisting of “There is a large number of cyclists all riding on the street and in the same direction!” Instead of dismissing these calls, law enforcement jumps. Imagine if pedestrians and motorists were treated the same way. Absurd? Yes! That’s the point. It’s not only absurd to hassle or restrict a group of people based on their mode of transportation, it’s a violation of our basic civil rights and it’s unacceptable. "I am (rank and officer’s name), a police officer to the City of Los Angeles. I hereby declare this to be an unlawful assembly and, in the name of the people of the State of California, command all those assembled at (give specific location) to immediately disperse, which means to break up this assembly. If you do not do so, you may be arrested or subject to other police action. Other police action may include the use of less lethal munitions, which could cause significant risk of serious injury to those who remain. Section 409 of the Penal Code prohibits remaining present at an unlawful assembly. If you remain in the area which was just described, regardless of your purpose in remaining, you will be in violation of Section 409. The following routes of dispersal are available: (give the most convenient route(s) of dispersal) You have __ minutes (give a reasonable amount of time – take into consideration the number of participants, location of the event and number of exit routes) to disperse." A proper dispersal is necessary to ensure that all present are aware of the fact they are to leave the area; that they know what routes to take. Without such an order, any arrest for unlawful assembly will be legally insufficient. Last night cyclists from San Pedro to Lincoln Heights to the Westside met in the center of Hollywood for a "Storm the Bastille" bike ride to the Los Angeles Bicycle Advisory Committee (BAC) meeting in order to deliver the "Bicyclist Bill of Rights." The BAC is a "Council and Mayoral appointed body" and acts in an advisory capacity to the Mayor, the City Council Members and to the various agencies of the government of the City of Los Angeles. 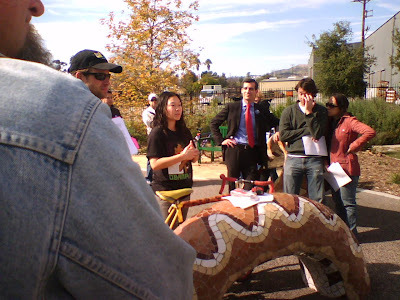 The cyclists challenged the BAC members to truly represent the cycling community, to take the BBR to the Mayor and the Councilmembers and to use the BBR to inform and direct the City Departments. Josef of the Bike Oven urged the BAC to fight for a new definition of traffic that counts people, not single occupant vehicles, and that recognizes all modes of travel when evaluating funding. He also urged the BAC to fight for a more comprehensive "livability index" as a tool for evaluating transportation which would factor in noise, pollution, safety for peds and cyclists and other quality of life issues that impact our communities, not just relying on the number of vehicles moved through the intersection. Russell pointed out that San Pedro is still waiting for arrival of the long-promised bike racks that would go a long way in encouraging cycling as a transportation solution in our congested neighborhoods. Other cyclists spoke of the need to communicate and educate and advise our law enforcement departments on California Vehicle Code and the need to support cyclists on the road, not simply to segregate and harass. With much fanfare and as the highlight to the meeting, MikeyWally took to the podium and read into the record the Bicyclist Bill of Rights! Counterpoint to this climactic and historic moment was our experience as we left the meeting and rode to Pure Luck for some sustenance and camaraderie. Four cyclists riding on Virgil executed a "Vehicular left turn" on the approach to the red light at Melrose. A car in the #1 lane accelerated up to the cyclists (approaching a red!) and stopped suddenly behind the cyclists who were merging into the left turn pocket. A LAPD Sgt. 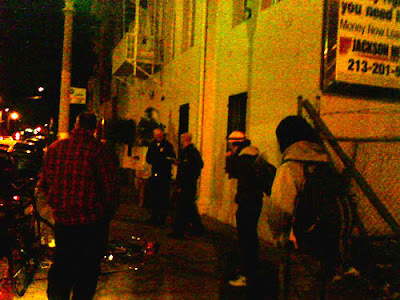 from the Rampart division pulled the cyclists over (letting the motorist go) and called in backup consisting of three squad cars and a helicopter. Excellent use of our tax dollars. After a severe round of safety lectures and threats of citations for impeding traffic including the appearance of the "ticket book" and the gathering of ID's, all because we dared to speak up for our rights and to suggest that it might be more appropriate for him to address the reckless behavior of a motorist who accelerates at cyclists on the approach to a red light, the Sgt. wrote Mikey a ticket for not having the appropriate reflectors. Sarge from Rampart did us a service by demonstrating his bias toward automobiles and against cyclists. He demonstrated how far the cycling community must go. He demonstrated how important it is for us to claim our rights, first by articulating them, then by exercising them. He demonstrated that item #3 on the BBR is worth fighting for! People ride bikes for many reasons. Some ride recreationally, some socially, some for exercise and some as a transportation and environmental solution. Through it all, the average cyclist is usually able to explain to their non-cycling friends why riding a bike in the city is an appealing, liberating, rewarding and positive experience. Missing from these conversations is an over-looked benefit to riding a bike in the city and that is simply the elevation of intelligence that occurs as a cyclist starts getting in some serious mileage. Witness the "Bike the Vote" event this past Saturday when a motley crew of cyclists gathered at the Eco-Village for a bike ride to Marsh Park in Elysian Valley. A simple ride turned into a conversation with City Council President Eric Garcetti on the significant ramifications of an Obama for President vote and ranged from transportation to health care to Iraq to the power of the people to speak up and to make national politics personal and to have meaningful input on the outcome. "Hey, cyclists, it's time to change the world!" Witness the "Storm the Bastille" ride this evening when cyclists will gather for a ride to the Boardroom of the DWP where they will challenge the Mayor's reps and the City Council reps who gather for the Bicycle Advisory Committee to truly represent the cycling community. 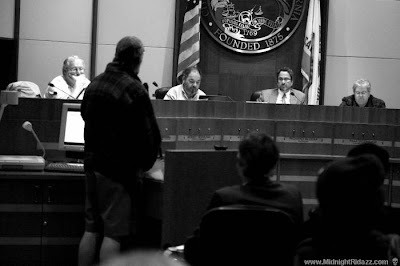 "Storm the Bastille" rides take place throughout the County and cyclists have Stormed the Pasadena City Council, the Beverly Hills City Council, the Santa Monica City Council and with great regularity, Los Angeles at many levels, always discussing with great eloquence the issues of the community. 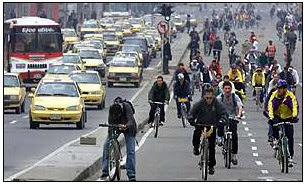 Ultimately, in going for a ride, cyclists connect. They connect to the street, the community, the environment and with each other. Through it all, cyclists develop an acute sensitivity to their surroundings, borne out of pure survival instincts and that sensitivity inevitably leads to the Battle Cry, "Hey, I've got rights!" That's right, cyclist have rights. We have the right to ride these mean streets and we have the right to ride safely and with the support and respect of our community, our leadership and our law enforcement. This is the Year of the Cyclist and this is the year that we claim and proclaim the Bicyclist Bill of Rights! In an effort to cut the budget deficit, LA’s Mayor San Antonio has announced plans to reduce the City motor pool and eliminate the “home garage” perk that a significant number of City Hall staffers currently enjoy. Opponents to the plan argue that this would mean that staffers would have to rely on personal cars, many of them gas-guzzling SUVs, minivans and sedans. Sadly, none of our City’s leadership looked at this situation and realized that this is an opportunity to get our City staff onto the streets, literally, on foot, on a bike or on mass transit. How far have we NOT come in our march to becoming the “greenest and cleanest big city in America” if it’s simply not an option for our leadership to get out of the car and go for a walk! This is a good time for the Mayor and the City Council to act aggressively, not only to cut costs, but to really lay down a city-wide commitment to supporting and promoting alternative transportation. Hire local – The City of Los Angeles could reduce congestion as well as its travel expenses simply by hiring local and encouraging city employees to walk, ride or use transit. Take it all the way through the departments! A City Council motion to requiring the General Managers of City Departments to live in the city has been floating for years with no success. Not even GM’s are required to live in the city? At one point, LADOT had a GM who commuted from home in San Jose to work in Los Angeles. How great would it be if City Staff actually walked the same streets, used the same bus stops, shopped at the same stores and could actually relate to the issues of our unique communities from the inside, not just from workshops and discussions and hearings. Hiring locally will also force us to confront the housing shortage. Staffers currently explain that their choice to live in other communities is based on a lack of affordable housing. We need to be talking about this and the answer is not to have City staff live in surrounding communities, it’s to grab the bull by the horns, confront the housing issue and get busy dealing with the shortage. Accessibility - Hold all meetings at locations that are accessible for peds, cyclists and transit users. This simple step will go a long way in reducing congestion in our neighborhoods. It will also go a long way in enlightening our City Staff on the issues faced by those who live in the neighborhood. Staff will truly experience first hand the lack of amenities for those who walk, pedal and ride transit. For example, the Griffith Park Master Plan Working Group holds its meeting at the Ranger Station in Griffith Park. There is no evening bus service, it’s a long walk with minimal amenities for peds and it’s dark, way dark. This commitment to meeting locations with full access should be complemented by full promotion on all meeting announcements of pedestrian access, bike parking locations and transit routes that service the locations. Current meeting information typically promotes parking directions as if parking is a birthright! Stop giving away “free parking” as if it’s free! Car Pool – Get the “City Family” to car pool with the other Agencies that hold meetings in our communities. In fact, hold the meetings together and perhaps even start to work together! Our communities currently host meetings held by the LAUSD, the CRA, the Metro, SCAG, Caltrans, LAPlanning, LADOT, DWP, RAP, CERT, our NCs, our City Council, our City Council Committees, and it goes on and on. We’re getting met to death. It is impossible to attend all the meetings of all the departments and agencies that have a piece of the neighborhood. It requires full time focus just to monitor, forget about participating and advocating and attempting to affect the process and the outcome. If these departments and agencies held meetings in the communities together, perhaps they would get to know each other and perhaps they would start to work together. For example, the LAUSD is coming to the neighborhood but they are unaware of the NC structure in the neighborhood, they are unaware of the Department of Neighborhood Empowerment. The community organizers were even unaware of the City’s early notification system! Why is it up to the community to point out conflict and disconnect between departments and agencies? Why is it up to the community to chase from one department to the next when the “Community Family” has a mandate to work together, represent the people and improve the quality of life in our community? Two weeks ago SCAG held hearings on its Regional Transportation Plan. Last week the LA City Council held an all-day session to present its Strategic Transportation Plan. The Metro is currently holding Westside Extension Transit Corridor hearings. The LA Planning Department and LADOT will be holding Bicycle Master Plan Workshops in the next few weeks. All these meetings on transportation and traffic congestion relief and solutions (complete with free parking!) will wear out even the most committed of community activists. If not, let’s consolidate, work together, bring the whole “Community Family” together and get back to the business of improving the quality of life in our community! Ultimately, the Mayor’s simple proposal to get rid of some of the City’s motor pool has in it the ability to create significant connectivity in our city. By hiring local city staff, by holding meetings that are accessible to all modes of travel and by getting the “Community Family” to carpool, literally as well as figuratively, we will have gone a long way to better representing our communities and improving the quality of life for all.